Rejuvenated. Does the word describe you when you wake up in the morning? Or do you, more often than not, greet the new day with a tired mind, sleepy eyes, and a few aches and pains here and there? A less-than-perfect pillow can result in poor sleep. It can also cause or exacerbate pain in the neck, shoulder, and spine. Consider changing your pillow if you frequently don’t sleep well or wake up with pain in certain body parts. One pillow type that you might want to consider is latex. These pillows do offer some great advantages. Read on to know about them in detail and some best latex pillows. What is 100% natural latex and what are its advantages? 100% natural latex is manufactured from a sticky white liquid obtained from a rubber tree. After collecting it from rubber trees, the latex is first thickened and then later baked at very high temperatures, following which it turns into the latex foam used in pillows and mattresses. Latex is fast becoming a popular material for pillows, and understandably so because it does offer some great advantages. Latex is firm but not too firm. It offers the right amount of support, proving extremely beneficial for people with neck or back pain over other types of pillows. Latex pillows, at least the quality ones, stoutly hold their shape for several years without losing any firmness and shape. Being extremely dense, latex holds shape and softness much longer than some other materials, for example cotton. In other words, you enjoy the same level of comfort every night. 100% Natural latex doesn’t like the company of dust mites and other allergens and keenly keeps them away from itself—a good thing for people with allergies. Synthetic latex, although it shares this characteristic of 100% natural latex, can give away a chemical smell, and so is not a great option for those prone to allergic reactions. There is 100 % natural latex and then there is blended latex (A term we will meet in a short while.). Latex is very durable and give you company for many years. This, too, is attributed to its ability to stay firm and in shape for many years. Latex is low maintenance. Being a sterile product, it doesn’t require much cleaning. When you do feel a need to clean it, ensure you don’t wet it completely. The Latex pillow should be spot-treated with soap and water and then left to dry. Do not put the cover back on until the pillow has dried completely. The term blended latex can mean different things, both in terms of the constituents used beside 100% natural latex and the composition of 100% natural latex and other materials. Latex mixed with fillers, chemicals, or additives is often labeled as blended latex, so is the blend of 100% natural latex and synthetic latex. This is something only you can decide. The performance report of each on most important factors to consider in a pillow purchase will help you make an informed decision. There is not much evidence to prove 100% natural latex last longer than the synthetic one. However, both long last significantly longer than other types of materials, like polyurethane or memory foam. 100% natural latex win this one. Because it is heavier and have more body to it, it is more supportive than synthetic. Both natural and synthetic latex smell. Natural, however, has a subtler smell. So, it wins (even though ever so slightly) this one also. You’ll have to air out a latex pillow, natural or synthetic, for a few days first. Synthetic wins this hands-down (Good for it; it was getting such a thrashing up till now.). The final score: 3-1 in favor of 100% natural latex. But as each factor carries a different weight for different buyers (for some price may be the deciding factor, while for some other it might be something else), the score is certainly not a verdict in favor of 100% natural latex. The two terms “100% natural latex” and “natural latex” are thought by many as the same thing—but they are not. 100% natural latex, obviously, refers to latex foam that contains only naturally-produced latex, without any additional material. “Natural latex” can be used for any blended latex combination so long as it contains a certain percentage of 100% natural latex. Now you know which label to check for if you want the 100% natural variety. It is really THIN—and that is proving to be its biggest selling point. Stomach sleepers need thin pillows, but there are not many great thin pillows around. You may want to give this low profile pillow (at 16" x 24" x 2.75" this pillow is as low profile as they come) a try if you sleep on your stomach. Thanks to its pin-hole design, the pillow is able to maintain a comfortable sleeping temperature, helping you enjoy a comfortable sleep, even on sultry nights. This pillow is mildew proof as well as dust mite resistant—a suitable option for those prone to allergies. There’s a “100% Natural” label on this pillow, meaning it contains only naturally-obtained latex, not the synthetic type. It is a good choice for someone who prefers to buy naturally-produced stuff. Oh, and just one more thing: It doesn’t smell. You can use it right out of the box. Can’t decide between a firm or a soft pillow? With one side firm and one soft, Z by Malouf is a good choice for the indecisive buyer. It’s basically two pillows in one, and with a single flick you can choose your favorite pillow for the night. The pillow cover is made of super-soft bamboo and is removable. Thanks to the bamboo cover and the pin-core design, the pillow does not let heat buildup, keeping you cool all night long. The 5-year warranty is another plus, especially for people who don’t want to buy a product without a decent warranty period. With a 7-inch thickness, the Two-Sided Plus and Firm Pillow is indeed thick. If you’ve not used a latex pillow before, you may take some time to adjust to your new purchase. The price of Z by Malouf, however, is on a bit higher side, although not unsurprisingly, as it practically packs two pillows in one, along with some other useful features. The Exceptional Sheets pillow conforms naturally to the weight and contours of your head, neck, and shoulders, reducing painful points and promoting a sound sleep. Another good thing about this latex pillow is that it is not too thick or too thin—it’s just about the right size for most people. 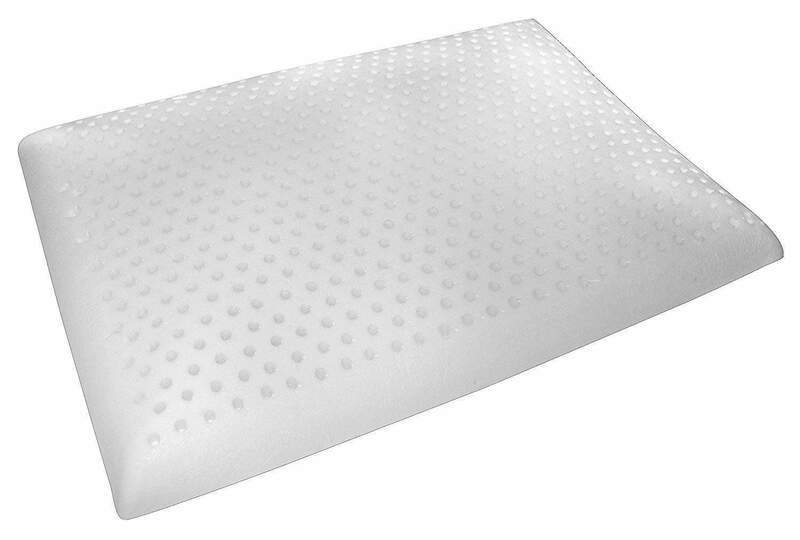 The Exceptional Sheets Pillow has a preponderance of pinholes (small holes that you see in the latex slab). While latex is naturally breathable, these pinholes enhance the ventilation process even further. You are not likely to have to worry about heat buildup inside the pillow. This is 100% natural latex. If you like products manufactured naturally, you might want to consider this pillow. The pillow does smell funny when new. You would have to air it out for some time before using it. The good thing is that the smell, although a little strong in the beginning, fades away rather quickly. The OrganicTextiles Encased Pillow is just about the perfect size in both length and thickness. (However, those who are used to overly thick pillows, like the ones that are 7-inche thick, may find it too thin). As this pillow contains only natural latex, it is a good option for all those who love green products. Thanks to natural latex, this pillow is able to offer good support to the head, shoulder, and neck. The Latex Organic Encased Pillow features an all-organic cotton zippered washable covering, a good feature for those who prefer a pillow covering that is both easy to take off and put back on. The pillow is dust mite and mill dew resistant, anti-microbial, and Hypoallergenic—must-have qualities in a pillow for allergy sufferers. Oh, and did we mention that this pillow has almost no smell? Yes, unlike most latex pillows, you can use it as soon as you take it out. The Simmons Beautyrest Latex Pillow cannot be described as a “hard” pillow. Nor as a “soft” pillow. The word that describes it best is ‘Springy’ or ‘Bouncy’. Is this a good thing? Bad? Well, this depends on your preference. If you like a pillow with “push back” support, you may like it a lot, because it has all other good features (listed below). But if you are used to a “hard” pillow, you are not likely to ever tag it as “my favorite pillow”. The pillow has a pin-hole design, meaning it breathes well and can be used in all weather conditions. 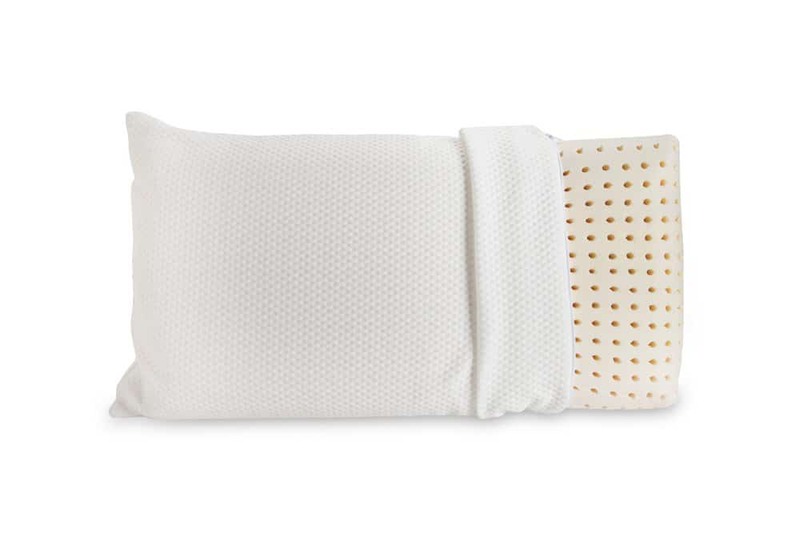 The Simmons Beautyrest Latex Pillow is resistant to fungus, bacteria, mites, and molds, which makes it a suitable option for all allergy sufferers. The pillow, however, does smell when you take it out of the bag. Let it air out before you put in under your head.